Born in Edinburgh, Scotland in 1840, John Murray had a long and varied career, first in the United States navy between 1857 and the Civil War. He had an avid curiosity and investigative talent that led him to work with the Erie, Pennsylvania police department and the Pennsylvania Central Railroad. Officers of the Canada Southern Railway knew of Murray’s work and hoped that he could help them with a series of derailments, thefts and fires. In May of 1873, Murray arrived in St. Thomas as head of detectives fro the Canada Southern Railway. He travelled between Buffalo and Detroit in his work, and frequently as far as Chicago. Murray investigated the bridge burning first, standing guard overnight in the bushes at the most frequently attacked bridge, catching the arsonists and sending them to prison. There was also trouble at the border with theft from rail cars. The thefts were occurring between places of origin in Boston and New York and their Canadian destinations. Murray narrowed the place of the thefts to Buffalo and surmised that the perpetrators had to be railway employees. 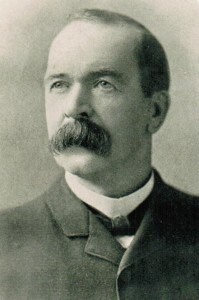 After his career in St. Thomas, Murray was invited to become Ontario’s first provincial detective in 1875 by Oliver Mowat, the Attorney General. He remained the “Detective for the Government of Ontario” for 31 years. He solved over 100 cases including the famous John Reginald Birchall murder case of 1890 in Woodstock and the Hendershott murder case of 1894 in St. Thomas. In 1897, he, along with two other detectives, created the Criminal Investigation Branch. This was a unit that specialized in areas of scientific investigation, and later became the Ontario Provincial Police.